So, remember how I wanted to start a Pizza and Wine Bar? Well…I still do…but, as usual, I have changed my mind. A little. Again. My new hope and dream is to start a diner. Not a greasy, old 50’s style diner. A modern American diner. Dustin and I have always thought about how cool it would be to serve diner-style food but in our own way. I’ll make pretty much everything from scratch every day, including the breads and pasta, and use all my own recipes. Especially now that I know how to cook roast beef and so many other tasty meats. On that note, I realized I’d need to have a good hoagie roll recipe for the diner. You know — for my French Dips, Meatball Subs and Philly Cheeseseaks. Check! This hoagie roll recipe is super tasty. The rolls come out chewy, yet soft, and with just the right flavor. Don’t worry: the pizza and wine bar can go on our winery when we create our vineyard. Some day. For now, I’m happy I can cook roast beef and these hoagie rolls so I can make some tasty French Dips! This hoagie roll recipe is super tasty. The rolls come out chewy, yet soft, and with just the right flavor. Perfect for adding to a French Dip once you check out how to cook roast beef! In a small mixing bowl, add yeast to 1/4 cup water. Sprinkle 1 tsp. 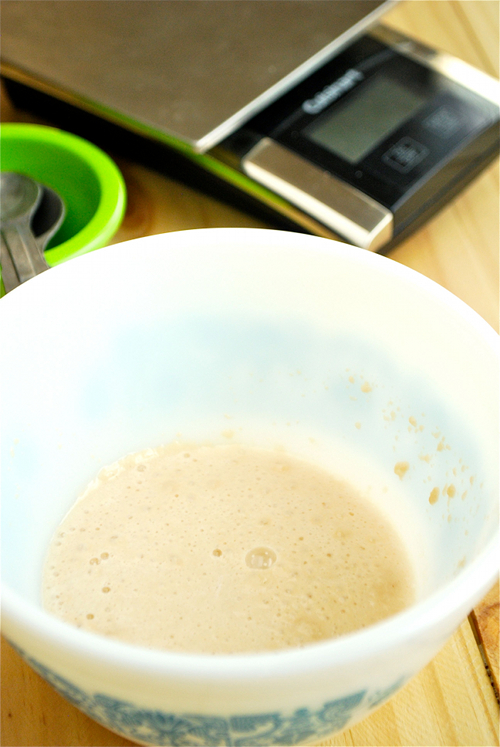 sugar over the mixture and let sit for 5 minutes, or until frothy/foamy. Add remaining 1 1/4 cups water and 1 tsp. sugar. Add oil and stir to combine. Combine salt and flours in a medium mixing bowl. Using a stand mixer, or by hand, add the wet mixture to the dry mixture. Beat until smooth on medium speed. If dough is too wet, add a little more dough to make the dough soft. Punch down dough and, on a lightly floured surface, divide into 8 balls. Shape each ball into a long oval, roughly the size of the hoagie roll you wish to make. Arrange long ovals on parchment paper about 2 inches apart. Slice a 1/4-inch deep slit across the top of each piece. Cover again and let rise an additional 25 minutes. As an avid baker and cook I like to try other recipes and glad to do so with this one. These are pillowy but sturdy enough to hold up. The crust was just the right texture. I do have a bread machine but did it all by hand and wanted to be sure they came out right, Plus, playing in dough is relaxing 🙂 Going to try your roast next. Will look further for more recipes. Since make majority by scratch breads, sauces, mains, sides etc. Better that way vs process. My SO came home and said he could smell them outside 😀 This recipe will replace another I was using. Just wonderful bread. Made it and it turned out great!! Can you use all bread flour with no all purpose? do I really need to use sugar in this recipe? can I simply omit/ leave it out ? please e-mail me a response to let me know at the e-mail below. The sugar helps the yeast grow and rise. You can try putting in less or none but in my experience it makes it heavier and more dense. I’d try taking out some but not all that goes in with the yeast. Made these, along with your roast beef recipe and made it into french dip! It was amazing and so easy! Everyone said it was the best french dip and the extra rolls they just ate them plain! Thank you so much! I took a picture to show you, but there’s no option to post a picture. Do these freeze well either before baking or after? Made these tonight to put my Philly chicken cheese filling on. They were not as pretty as yours but they had amazing flavor. This recipe is awesome. I use it daily! Afternoon all. I came across a question about making this dough In a bread machine. The answer is yes you can. I did my dough In mine and then followed the rest of the directions for rising and shaping. They just now came out of the oven and look fantastic. Their going for meatball subs tonight. I just dumped my other hoagie recipe for this one. So you can make by hand or you can use your bread machine If you have one and are short on time like I was today Cant wait to try ’em. Hi, this is my first attempt at baking from scratch. What does punching down do,how many times do I do it in this recipie? Will this dough keep in the frig. ? If so for how long? Wish me luckO:-) …. Yay! Congrats on baking your own bread from scratch! Punching down the dough removes some of the gas bubbles formed by the yeast during the rising. It also redistributes the yeast, sugar and moisture so it all can ferment and rise the dough during the proofing stage. Only need to punch down once for this recipe. Yes, this dough will keep in the fridge but I recommend doing it after rolling the dough out but before letting them rise one last time. Then, when ready to bake, allow them to rise after removing from the fridge and continue with the recipe. I was wondering how well this dough would freeze? I like to make several batches at a time and freeze in breadstick form. Then just pull out a couple at a time let thaw and raise so I can send my hubby to work with fresh bread all week long. Dana, I’m wondering – how did the freezing of the dough work out for you? I’d love to hear your experience and words of wisdom if you’re willing to share. I too want to keep the family stocked with fresh bread and I love your method!! Yesterday was my first time making bread from scratch and it was a disaster (not your recipe). Today I made these with no problem and they are delicious! Mine certainly aren’t as pretty as yours but they still taste great. Mine do not have that beautiful browned color. Can these be egg washed before baking? Thanks so much for a great recipe! Few! Was afraid it was this recipe that was a disaster at first. I’m so glad these turned out for you. Yes, you can totally use an egg wash on these if you’d prefer. This ex-Philly girl is dying for some good hoagie rolls! I’m wanting to make these today but only have all purpose flour. Does the 1/2 bread flour re ally ma me a difference? hi , I would like to know if u roll out the dough flat and then roll it backup or u just make a ball ???? hi. lacey I have been making lots of different recipes for hoagie roll and I did like them. but now I found an AMAZING one. yours we LOVE this hoagie rolls.and they are so so GOOD.. thank you for this recipe. I just made these for my husband and I to make sandwiches out of. We just ate one of the rolls plain because it was so delicious! I’m not a very experienced bread maker, but these came out so amazingly well. We’re so happy with them! These look so good, can’t wait to try it. Have you ever shaped this recipe into a loaf of french bread? ‘Cause that’s what I’m about to attempt, and I’m hoping it works. Suggestions? I’m from Denmark and we don’t really have ‘bread flour’ and ‘all purpose flour’. Can you explain the difference? Or is it fine to just use regular wheatflour with some wholewheat mixed in. If so, how much wholewheat is appropriate? Hi Mads. Bread flour is just a higher gluten count than all purpose flour so it is better to use to make breads and cookies. Using whole wheat flour in the same quantity should be fine as a substitute. This recipe worked really well for me! I replaced 1 cup of the bread flour with 1 cup of whole wheat bread flour and used the dough setting on my bread machine to mix. Thanks so much. I really like your website and your approach. Homemade food always tastes best & now that my little ones are getting older they love to help me cook. These hoagie buns were easy and delicious! Your recipes are fantastic 8′) keep up the great work. My family loves everything!!! I’m from Philly and have been looking for a good hoagie roll recipe. After a couple different tries (and failures) I can say that this one is the best! Thanks for sharing! 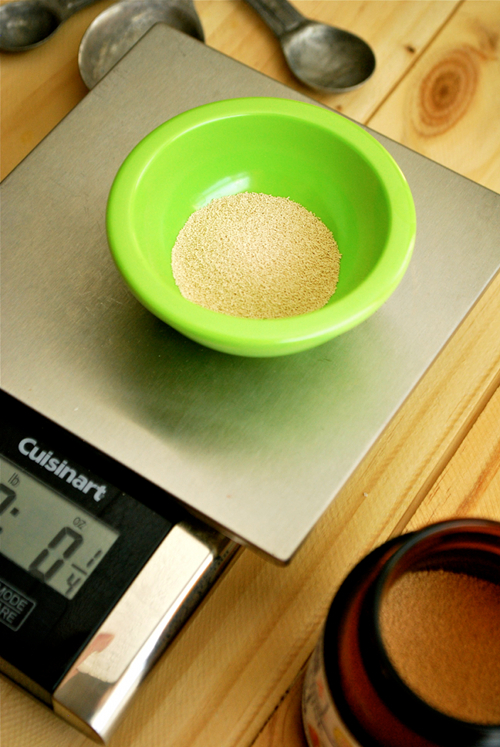 I believe 1/4 oz yeast is equal to 2 1/4 tsp, but in the recipe not sure to use 1 1/2 or 2 1/4 (1/4oz)tsps??? 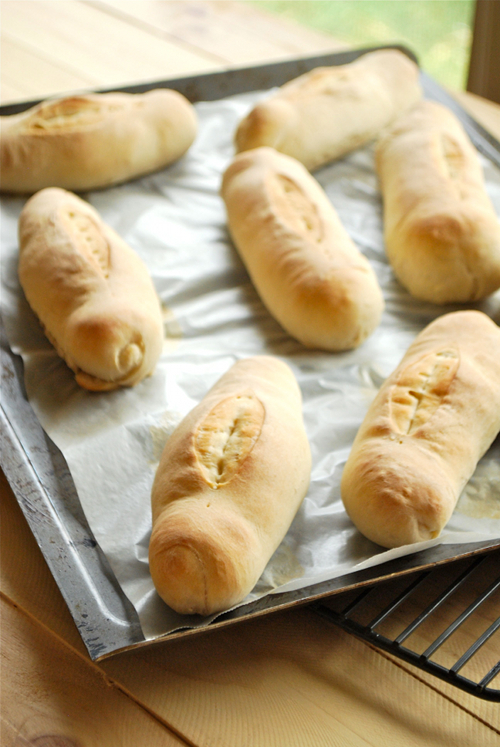 I just pulled these out of the oven and tried them with butter….YUM!! My son loved it too. I made these for his sandwiches foe school as I didn’t feel like running to the store. I very much prefer these! I don’t blame you, Carol! 🙂 I’m so glad the rolls turned out well for you. 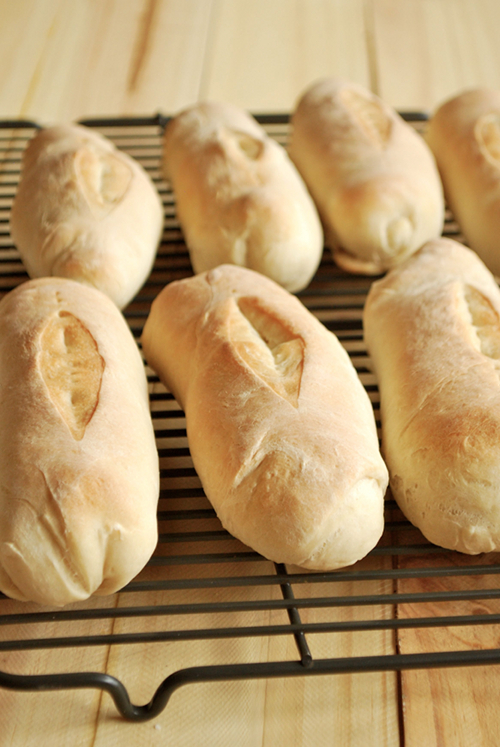 I made meatball sandwiches tonight with this fresh baked hoagie bread and they were fantastic! Great roll. Great crust!! I am relatively new to bread making, so please go easy on me! When I tried your recipe, I found them pretty dense and not as light as other rolls. I usually do things by hand. What did I do wrong? Not let it raise enough/overknead? Any feedback would be helpful! Hi Tom — bread making can be extremely frustrating, so please don’t worry! For how long did you kneed the dough? Did you get it to the point where it got elastic? That can make a really big difference in whether the dough is light versus dense. This recipe will make a more dense roll as well, which may just not be what you’re looking for. These were great! The only complaint I have is that they were pretty salty. Next time I’ll cut the salt down to 1 1/2 tsp and see where that gets me. Otherwise these are perfect rolls. The crust on them is fantastic – crisp, but not too crisp. And the center is fluffy and soft. Yum! After searching for zucchini noodles, finding you and perusing your site, I spotted your article on roast beef. Noticing how rare it was, I realized that you are after my own heart. You have been bookmarked. Made ’em last night as a trial run for Friday. Actually shaped them as hamburger buns (yielded 8) and they were very good. A hearty dense yeast roll that’s easy to make. Thanks again! So glad to hear they turned out well for you! Thanks for sharing. Hoagie rolls look great-going to give them a trial run tonight-the better half has a pot luck she’s going to on Friday, so I offered to make rolls-these fit the bill! I hope the rolls are a hit! Interesting recipe … gone into my “to do” file. I hope you enjoy the rolls, Conna! 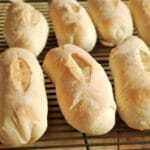 This is very similar to my french bread recipe that I use my bread machine to do the work for me. I use the dough setting. Then after I roll out and form my bread or rolls I let it rise again on the baking pan. I read somewhere to put a bowl of ice cubes in the oven while it bakes and the crust gets a little crisper while the inside stays soft and tender. Last weekend I made them in club-sized rolls for the pulled pork I had in the crockpot. When you make everything from scratch a few shortcuts are nice. Love your website and recipes Lacey!! Hi Diane! 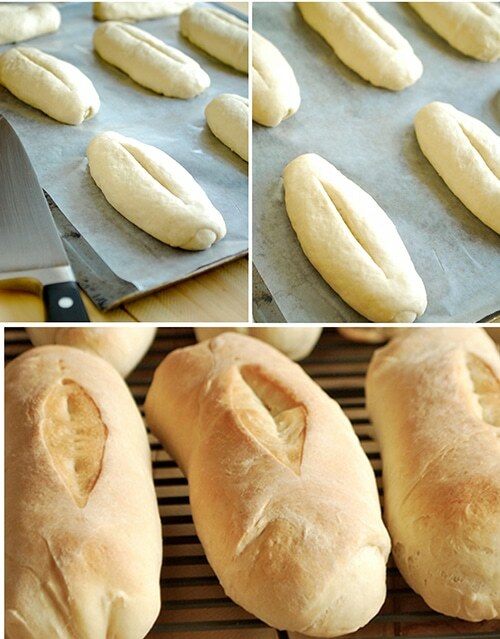 Thanks for sharing how you make your french bread. I usually use my bread machine to make the dough too, but I just got a kitchenaid mixer and I’m in love. See you around! Kitchenaid mixers are awesome! I got mine 21 years ago and still LOVE it. This summer I got the ice cream maker attachment – incredible! Enjoy yours Lacey! I haven’t tried it in a bread machine, but I imagine it would work as well — just take it out and follow the directions after letting it rise the first time. I’d love to know how it turns out! I tried this in the bread machine and followed the direction after letting it rise the first time, they turned out perfect! Thanks for your website love it! Thanks so much for posting how it went in the bread machine!